The World Dryer SMARTdri K-970 fast hand dryer is one of most intelligently designed hand dryers. Built by World Dryer, the automatic Smartdri is a high speed, drying hands in 10 seconds. The K-970 has an aluminum cover with a polished chrome finish. Featuring a multi-port nozzle, the Smartdri allows for a fast comfortable dry and flexible controls allow for a customized air flow by adjusting to one of the 3-speed settings. 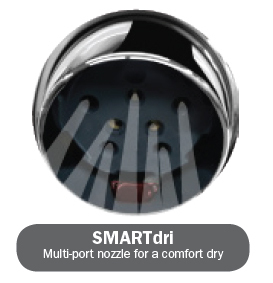 The energy efficient Smartdri also has a heat on-off switch allowing for low power consumption. The World Dryer Smartdri K-970 fast hand dryer is a surface mounted hand dryer, but can be recessed to meet ADA requirements by adding the optional recess kit. The Smartdri is a great addition for any commercial restroom. SMARTdri fast hand dryers require a dedicated 15 AMP circuit, and must be properly grounded. GFI circuit protection is recommended. One side of dryer should be mounted to a stud. Get Free Shipping on the K970 Smartdri hand dryer and all orders over $155. Select "Free Shipping" at checkout. Sent via UPS Ground. Continental US domestic orders only. Need it sooner? Other options are also available at checkout. HandDryerSupply.com has the lowest price on the Smart-dri K-970 hand dryer. We are a trusted World Dryer distributor and will match or beat any advertised Smartdri K-970 price online. Call 804-859-2498 to talk with a customer service rep now.